You've seen them all over Pinterest - fruit bath sessions are all the rage right now! Meggin Linquist Photography is now offering them for the Spring and Summer at a super deal you're not going to want to miss! Now through August I am offering fruit bath sessions for $175 (typical sessions are $550 - so AMAZING deal)! 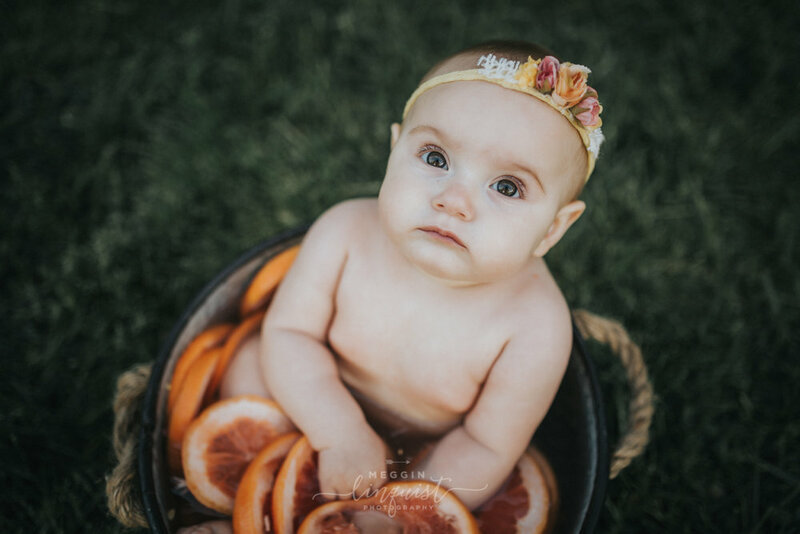 You get to choose from varies fruits, and I have an assortment of adorable tiebacks and floral halos for your little gal. Location will be outside (although I am thinking of offering them in studio once I test out what I have in mind). These sessions are best for those little ones who can sit unassisted (roughly 6 - 12 months). There may be a time that I offer them for bigger kids (13 - 18 months). Ready to book this adorable session for your little one? Contact me today to book your session!